VERY relaxing, airy, comfortable, incredibly clean 2 bedroom, 1 Full Bath (recently remodeled) with shower/tub. Newly remodeled kitchen, newer sleeper couch and reading chairs, brand new king and queen size beds (down comforters, new sheets, new pillows) small flat screen TV with DVD player, stereo. Outdoor sauna with private outdoor shower, air conditioning, front deck, large pier with bench seating area. Fire pit surrounded by benches, Weber Genesis gas grill, new patio set for outdoor dining, lakeside patio with Adirondack chairs. Cottage sits on 400' water frontage on a peninsula with complete water views, yet secluded. Lake is limited-wake. Loons will wake you up in the morning. No public access or boat ramps. Fishing can be good to great depending on time of year with bass, bluegill and walleye. Cottage is minutes away from premier trout fishing on Prairie River (recent Trout Unlimited project work) where the State Record Brook Trout was caught. Water is gin clear, great swimming!, no weeds, sand and gravel beach. ATV trails accessible from cottage. Aluminum 14 foot fishing boat with electric motor, 3 person paddle boat available for guests. For those who need it, satellite internet is available for an (OPTIONAL) weekly fee. The Jones Family has made this unique cottage our summer place since 1976. We started renting the place about 10 ago. We keep the place well equipt for a stay because this is still our summer cottage when it is not being rented. You will not be disappointed. You need to relax and reconnect with your family, faith and friends....THIS is the place to do that. This place is special. You will sleep well, connect and relax. Some places are magical....this one is. Recently remodeled bathroom, shower/tub. Kohler cabinet, mirror. 400 feet of quiet peninsula frontage, terrific sand gravel bottom. Clear water. Fantastic AC cools the entire place. Nice cotton towels. Beach towels as well. brand new french door fridge, new gas stove, huge work island. we keep basic ingredients stocked. Complete set of dishes, knives, pans, etc. Newly remodeled kitchen, large island for entertaining, should have everything you need. Dine inside or outside. Plenty of seating with terrific views of the lake. Brand new kitchen island. Great lighting. 14 foot aluminum boat with electric trolling motor and battery. 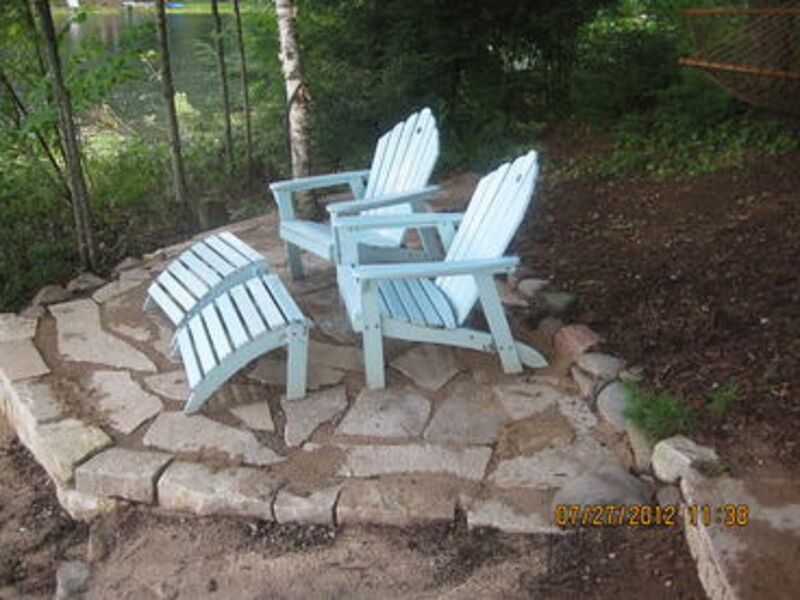 Several seating places both near the cottage/fire pit. Also at the lake shore. Some noodles, floats, goggles, etc. Unfortunately, we do not have ramps into the home or down to the lake. Great sauna, would fit 4-6 people. Attached outdoor shower. Private. We enjoyed the fishing, the boating the beautiful cottage and surroundings. We will return. Very quiet place with great views and wildlife. Had everything we needed and fishing was very good. Owner was very helpful with answering all our questions. I’d recommend this to my employees to stay here. This place is truly amazing! The location of this house on the point is perfect! Water on 3 sides, great outdoor area to relax, sit back and watch the loons and stars, enjoy a fire or have dinner. The house itself was clean and had everything you need for a relaxing, fun get-away! The pier and use of boats were so nice and the fishing was great! On top of all of this, the owners were helpful and great with communication. I cannot say enough good things about this place! We will for sure be coming back next year! This property continually receives five stars and for good reason. It was cozy and quaint, yet spacious for our family of four. It is a perfect blend of northwoods feel with modern convenience. The lot is extremely private. The owner has generously provided a boat with trolling motor, a peddle boat, ample dry firewood and much more. We typically rent a different cabin each summer, but the four of us agreed we will return to Jones’ cottage next year. Secluded tranquility on a beautiful, loon-guarded lake! Great location on a beautiful, peaceful lake! We really enjoyed our stay at this cabin while we were in the area for a family reunion. It was very clean and really well equipped. The air conditioning is a huge plus and not common in these parts! The lake is clear, great for swimming, fishing and boating. The paddle boat is so wonderful to have and let’s you quietly explore the lake while getting a bit of exercise! Loved hearing the loons in the morning and star gazing in the evening. The patio area is well equipped and maintained. Would love to stay again when we have more time to just relax and enjoy the lake! fly fishing very close by, Prairie River is a top rated trout stream with recent TU improvements.